The average dental assistant earns anywhere between $32,000 and $36,000 per year. Some states require dental assistants to take an accredited course, pass a state exam and receive proper certification while other states do not have any formal requirements. It is definitely preferable to have certification in place when searching for new employment. Many dental assistants receive bonuses if they have been working in the same office for many years but this varies between employers, depending upon their practice and directives. The highest paid dental assistants earn an average salary of $43,480 in the State of New Hampshire with those in Minnesota coming in at a close second with an average annual salary of $42,420. The best paying jobs are in private dental practices, with average salaries standing firm at $35,070. Ambulatory Health Care Services jobs for dental assistants pay on average $32,760. As of 2012, there were 303,200 dental assistants working the United States. 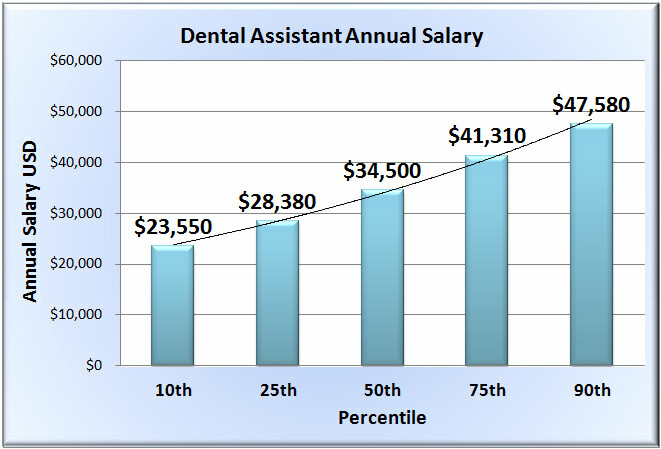 Of those dental assistants, 275,580 were earning an average salary of around $35,070. The employment opportunities for certified dental assistants is expected to grow by 25% before the year 2022 which is much quicker than most occupations. If you are looking for a rewarding career that is enjoying continued growth, becoming a dental assistant is definitely a good option. As of 2012, there were over 303,200 dental assistants employed across the country.